Posted on September 7, 2016 at 10:32 am. Maurice Blackburn Lawyers will represent Shonica Guy pro bono as they take Crown and Australian gaming software manufacturer Aristocrat to court. Guy has claimed the pokies machine she has spent playing for the past 14 years is deceptive – specifically that the design and features of the machine are illegitimately and unfairly misleading to gamblers. The machine is called Dolphin Treasure and is one of the more popular slots inside Melbourne’s Crown Casino. The Dolphin Treasure machine has been analysed by Monash University researchers, and the court case will center on the alleged uneven spread of symbols across the five gaming reels (columns) required to appear for winning payouts. Maurice Blackburn Lawyers examine all other design features of the game, including the machine’s visuals and audios the law firm claims to disguises and misrepresents losses as wins. Guy also suffers from a gambling addiction, having started playing the slots in Adelaide when she was only 17, at a local club. She continued to play for the next 14 years of her life. “It took over my life; half my life was wasted. I was hypnotised for a decade, I didn’t know I was hooked, then someone said, ‘I think you are hooked’,” Ms Guy said. Australians spend more money on gambling than any other nation in the rest of the world, per head. 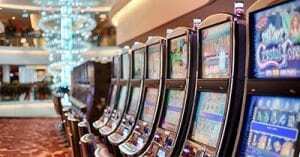 Australians also lose more than $11 billion on the pokies each year, while approximately $2.5 billion is lost on these types of machines in Victoria alone. Approximately one billion dollars is handed to the Victorian state government in taxes. Crossbenchers within the Australian government have been loud advocates to tackle the issue of problem gambling within the country for decades now, and spokesperson of the Alliance for Gambling Reform, Tim Costello, has come out in support of this most recent Maurice Blackburn Lawyers case against Crown and Aristocrat. “This is the people versus Packer. And it’s about time the people had a real win,” Mr Costello said. Should the one Dolphin Treasure machine prove to be deceptive, other machines will also be investigated, and this will have serious consequences for James Packer’s Crown and the Aristocrat gaming industry. Both Crown and Aristocrat did not desire to comment. A player bringing to the attention of a law firm company that the gaming machines she/he plays disguises its losses as wins, and does not allocate an even spread of its symbols, represents a new and very specific investigative angle to the legitimacy of Australian gaming machines. Maurice Blackburn Lawyers has previously been involved in a case against Australian gaming operators, with the aid of a coalition of anti-gambling groups (including the Alliance for Gambling Reform), arguing companies that operate pokies games are engaged in deceptive behaviour that breaches consumer laws, clearly knowing the slots they offer are a major source of addiction. So this new law suit will add fuel to an already burning fire that is attacking the Australian gaming industry – independent groups determined to restrict the ease at which players can lose money on the pokies, to aid in the reform of problem gambling that is rampant across the nation. It’s always important to only ever play at online casinos which have their games independently audited and verified by third-party software engineers and random number generator testers as fair and responsible when it comes to general gameplay and final payouts. We have done the research to find our readers only the most legitimate and reputable real money casino sites known for strictly adhering to fair and responsible gaming practices. If you are reading this from United States, the best online casino licensed and regulated to legally service your country is Raging Bull Casino.